The industrial families of the 19th century such as Tata, Birla, Bajaj and Godrej, were strongly devoted to philanthropically motivated, social and economic causes. Even Mahatma Gandhi’s Khadi movement, which was an integral part of the Swadeshi movement and which encouraged Indians to be self-reliant, received huge support from the Bajaj family. During the Independence phase, Mahatma Gandhi introduced the notion of ‘trusteeship’ which encouraged businesses to establish trusts for educational institute and also helped in setting up training and scientific institutions. However, according to a survey carried out by Forbes India, only six out of the top 100 companies of India contributed more than 2% of their profits after tax (PAT) to Corporate Social Responsibilities (CSR) activities. It is for this reason that a provision for mandatory CSR spend has been included in the Companies Act 2013. According to industry estimates the mandatory CSR laws would apply to about 9,000-10,000 companies. The new provision has received criticism not only from corporations but even from the supporters of CSR theory who believe that CSR activities, though a necessity, must be taken up voluntarily. This article analyses the impact of the Companies Act 2013 on the Corporate sector with respect to the new CSR provisions. Although it has existed as an academic subject for over half a century, there is still no consensus over the definition of CSR. The Companies Act 2013 does not define CSR, nor does it provide what exactly constitutes CSR activities. However Schedule VII of the Act does provide a list of activities which may be included by companies in their Corporate Social Responsibility Policies. The words ‘may be included’ clearly signify that the list is not meant to be exhaustive but only suggestive. It is submitted that this list, even though merely suggestive, is inadequate. Several types of CSR activities have been omitted and such omission may lead to a large amount of confusion and even litigation. Thus, when it is doubtful as to whether an activity falls under the ambit of CSR activities, the benefit of the doubt must always be given to the corporation. The earliest traces of the theory of CSR as an academic subject can be found in H.R. Bowen’s “Social Responsibilities of the Business” in 1953. Since then, there has been continuous debate of the concept and its implementation. 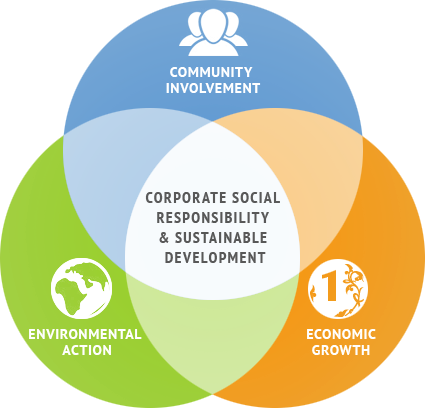 CSR aims to achieve positive impacts on the environment, consumers, employees, and the communities. Under the force of globalization, this theory has been challenged by the diminishing different roles of the government and firms, especially when the power of multinational companies is rising. This vagueness gives rise to certain complications since a desirable scope of businesses’ commitment can be subjected to varied interpretations. Since there is no one universally accepted definition for corporations to rely on, it leads to different levels of engagement of policy with different corporations. However, today there are fewer supporters of Milton Freidman's theory of 'capitalism and freedom' and over the past two decades or so, CSR has blossomed at least as an idea, if not as a practical programme. In 2009, the Ministry of Corporate Affairs had issued Corporate Social Responsibility Voluntary Guidelines (‘the Guidelines’) which explains that under those guidelines CSR was not philanthropy and the guidelines clarified that those CSR activities which companies would undertake beyond any statutory requirement or obligation would be purely voluntary. It was also stated that although the guidelines were tailored keeping in mind the Indian scenario, the guidelines would be helpful for overseas operations as well. Until 2013, CSR was not made mandatory. (iii) Profit of Rs. 5 crore or more. Companies which fall within the CSR limit must discharge CSR responsibilities through Board Committee which must comprise of 3 or more directors including at least one independent director. It seems that Private Companies shall have to appoint independent directors for this purpose although it is not required to have independent director under section 149 of the Act. The Draft Corporate Social Responsibility Rules, 2013 (‘the Rules’) provide that for the purpose of compliance with section 135 of the Act and the Rules CSR activities within India are only to be taken into consideration. The Rules, which provide that only activities which are not exclusively for the benefit of employees of the company or their family shall be considered as CSR activity, makes a departure from the Guidelines which completely prohibited employees from being direct beneficiaries of the CSR activities of the company. It is submitted by the author that Section 135 of the Act provides a very vague and broad legal frame-work. The provision does not give authorities the teeth to prohibit companies from simply having a CSR policy and spending some money and disclosing the reason for not spending 2% of average net profit using second proviso to Section 135 (5). Draft Corporate Social Responsibility Rules, 2013 are also ambiguous. There is no specific provision dealing with scenarios where the prescribed money is not spent, then whether such lapses or to be carried forward as liability in the balance sheet. What if that carried forward amount keeps growing over the years? The only mention of such amounts is in annual reporting format which requires that the amount carried forward be mentioned. The preamble to CSR Rules state that "CSR is a way of conducting business, by which corporate entities visibly contribute to the social good. Socially responsible companies do not limit themselves to using resources to engage in activities that increase only their profits. They use CSR to integrate economic, environmental and social objectives with the company’s operations and growth." The theory of CSR is based on the idea that corporations should be responsible for our society since they are also actors of the social institutions, but with respect to what aspects they are responsible and to what extent they can be held responsible, are not clearly defined in the definition. •Cause-related marketing. For example when the company's logo is associated with a particular charityevent or programme. The company builds a reputation and its brand name is also spread. The "Aditya Birla Centre for Community Initiatives and Rural Development"
The author is of the view that disclosure is not the remedy of non-spending and this has been clearly amplified by Mr. Sachin Pilot in his interview. Of course, the second proviso to section 135 requires disclosure in the board's report in case it fails to spend the required amount along with providing reasons for not spending. The disclosure requirement should not be taken as a remedy for non-spending but inability to spend the required sum must be acceptable for logical reason. According to T.P. Ghosh, such reason, cannot be liquidity problem during the current year but could be linked to overall CSR policy, issues relating to project implementation or setting aside a portion of money for emergency relief work, etc. It is submitted that the current CSR provisions contained in the Act and the Rules, although ambiguous, are not unreasonable. The limits prescribed in section 135(1) ensure that mandatory CSR only applies to large corporations; therefore, there is no pressure of mandatory expenditure of 2% of average net profits on smaller companies. CSR is not necessarily a win for society, but also for the companies. Properly implemented, participating in CSR activities is also an excellent method for companies to promote their brand name and to show the people that they care, thus building a good reputation in the market. Whether it is right to let social service activities be commercialized or not is an entirely separate debate, but it cannot be denied that CSR activities do make a huge difference. Wipro in its 2010-2011 sustainability report stated that mandatory CSR laws would in time prove to be counter-productive since companies, in the pressure to comply with the laws, would find contrived ways of meeting the requirements prescribed by the laws. It further declared that Wipro’s stance was that CSR must flow naturally from a company’s ‘values and convictions’ and that CSR activities would get the optimal results if they are in line with the company’s mission and goals. The mandatory CSR laws allow companies to invest the 2% of PAT in a variety of manners. It is in every way better than an additional tax of 2% being imposed on companies, in which case companies would have no say on how that money would be spent or where it would be invested. The author would like to part by paraphrasing Edward Thurlow, 1st Baron Thurlow, not quoting him, but as he has often been misquoted: "Did you ever expect a corporation to have a conscience, when it has no soul to be damned, and nobody to be kicked?" † This article reflects the position of law as on 21st March 2013. The actual quote is “Corporations have neither bodies to be punished, nor souls to be condemned; they therefore do as they like” and is quoted in John Poynder, Literary Extracts (1844), vol. 1, p. 268. .